IN THE NEWS: "CSI Effect": Fact or fiction? "CSI Effect": Fact or fiction? Since introduced by Time magazine in 2002, the "CSI Effect" has become a cultural staple, imbued with the imprimatur of fact. The judicial system and media discuss it as a grave problem; the FBI has even produced a video warning of its impact. Just last week, the Economist of London issued an uncritical report asserting the reality of the effect, based on an upcoming article in Forensic Science International. However, as Mind Hacks pointed out, both the Economist story and the underlying FSI article rely mainly on anecdotal evidence. The scientific verdict is not yet in. Indeed, when I last discussed the phenomenon here, two years ago, a study by Michigan Judge Donald Shelton was raising doubts. Judge Shelton found scant evidence to support claims by prosecutors that jurors' unrealistic demands for hard scientific evidence were causing unjustified acquittals. As the debate continues, I thought it time for an update. I find it ironic that a phenomenon being blamed for injecting a biased expectation of science into the courtroom has not in itself been subjected to much scientific scrutiny. After all, anecdotes are not science; they can be used to prove almost anything. As it turns out, some legal scholars are putting the CSI Effect to empirical scrutiny, and -- guess what -- a measurable effect in the predicted direction is hard to prove. 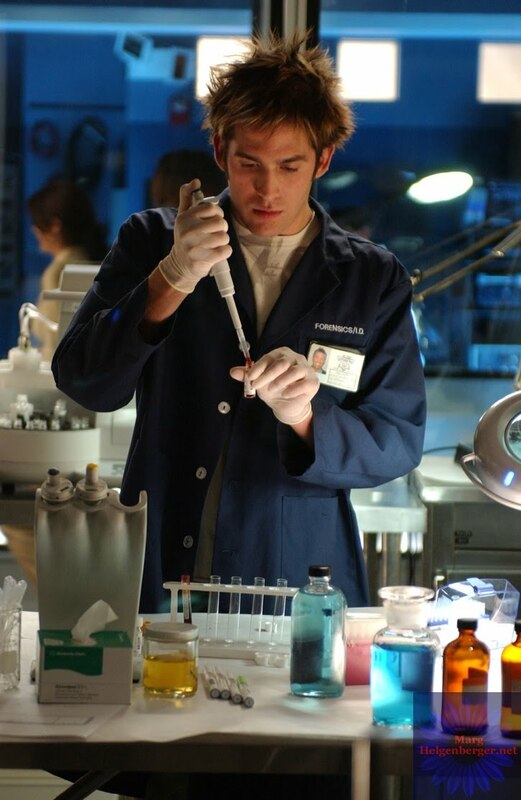 In fact, if Crime Scene Investigation and other enormously popular forensic TV shows are having any effect, it may be in the opposite direction -- toward making juries more conviction-prone. Mind Hacks provided links two excellent scholarly analyses, both available online and well worth reading. The first, by Simon Cole, a Criminology, Law and Society professor at UC Irvine, and doctoral student Rachel Dioso-Villa, was published last April in the Stanford Law Review. The second, by media law professor Kimberlianne Podlas of the University of North Carolina, was published in October in the Loyola of Los Angeles Entertainment Law Review. Podlas initially devised a creative plan: She would ask prosecutors to give her details of cases in which they believed an acquittal was due to the CSI Effect; then she would have defense attorneys review the case files for alternate explanations. But, she found, 19 of the 20 cases provided to her by prosecutors had actually resulted in convictions, thereby disproving the effect. "What is labeled a CSI Effect may more accurately be described as a rationalization embraced by members of law enforcement who find themselves on the losing side of a prosecution. 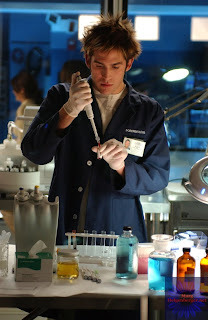 By attributing a loss to CSI's wrongful influence, a prosecutor can obtain an explanation yet maintain a belief that an acquittal was misguided. Although this cognitive rationalization is understandable, it should not be mistaken for empirical proof that the CSI Effect operates anywhere other than in the minds of those proposing it." "Tort reformers' narratives captured a much greater share of media attention than did those of scholars…. Indeed, in the wake of media claims about the litigation explosion, socio-legal scholars documented that media coverage of civil law overwhelmingly emphasized plaintiff victories and high punitive damage awards. Thus, the supposed existence of a litigation explosion became educated common sense among jurors and even judges." 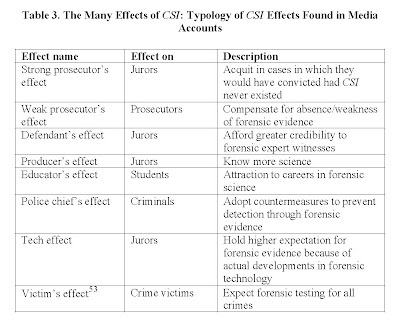 "Echoing the litigation explosion, CSI effect discourse is widely disseminating through the American public the belief that television drama is disadvantaging criminal prosecutions. And yet, the available evidence does not support this claim. Indeed, the available evidence suggests that the opposite may just as easily be the case: forensic-themed police procedural dramas may actually advantage the prosecution in criminal cases." "Jurors who are consumers of the popular media might believe that prosecutors are typically disadvantaged in criminal trials; that high expectations for forensic evidence are 'unreasonable'; and that criminal convictions are becoming increasingly rare and difficult to achieve. Jurors who believe these things might be more sympathetic to prosecutors out of sympathy for the perceived underdog or in attempt to correct for the perceived excesses of antecedent juries. Claiming to be disadvantaged is a familiar trope in trial advocacy, especially in opening and closing arguments; prosecutors frequently point out that they bear the burden of proof, whereas defense attorneys often refer to their lack of resources or to the awesome power of the state." "If there is a CSI Effect, narrative theory and common sense suggest that it will benefit law enforcement. 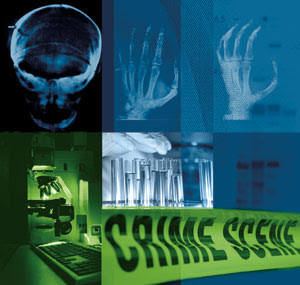 CSI features the fantastical world of forensics and smart police work. …This story may cultivate the notion that forensic scientists and their methods are legitimate and reliable, thus bolstering the prosecution’s case…. Indeed, scientific evidence is very seductive to jurors, and they tend to overvalue its probity and overestimate its infallibility." 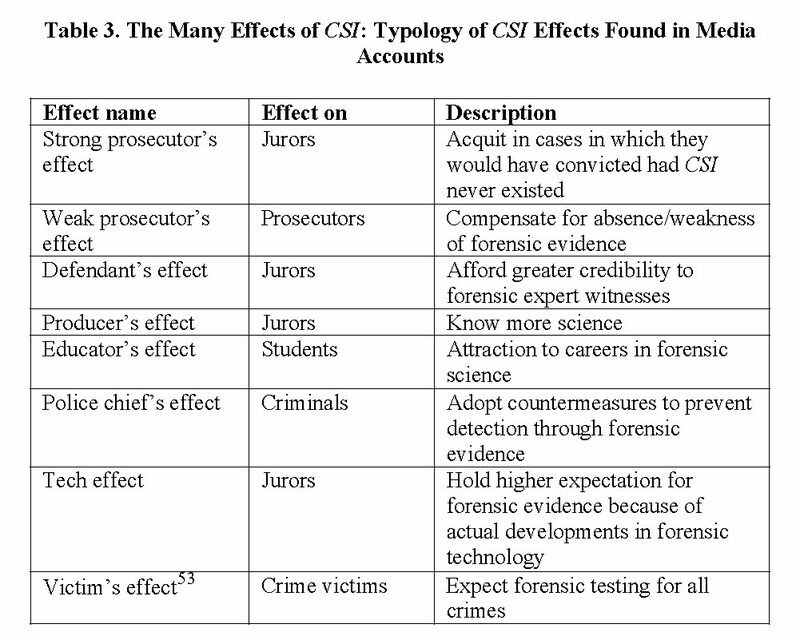 Although the CSI Effect pertains to criminal court while the Litigation Explosion myth targeted the civil realm, they share a similar distrust of jurors, that is, of the ability of common citizens to be fair and find the truth. 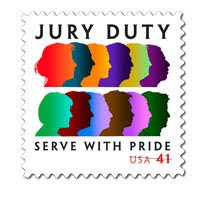 This lack of faith, from my experience as a court observer over several decades, is misplaced. FYI, the "McDonald's coffee spill" is not an urban legend. i have no idea about the poodle and probably don't want to. But otherwise, this is an excellent article, and all the links are extremely helpful. Thanks for your comment, Melissa. You are right; it wasn't an urban legend. It was an actual case. But it was distorted beyond recognition by tort reformers seeking to limit citizens' rights to sue corporations. It's the topic of a recent movie called HOT COFFEE -- www.hotcoffeethemovie.com.